You are an expert at the law, but are you also an expert at giving thorough and well-informed financial advice? It can hard to be both things, particularly with how often financial investments, products, and options change. Keeping your client's best financial interest in mind is important when trying to reach a fair settlement, and provide them a satisfying and quality experience with your firm. 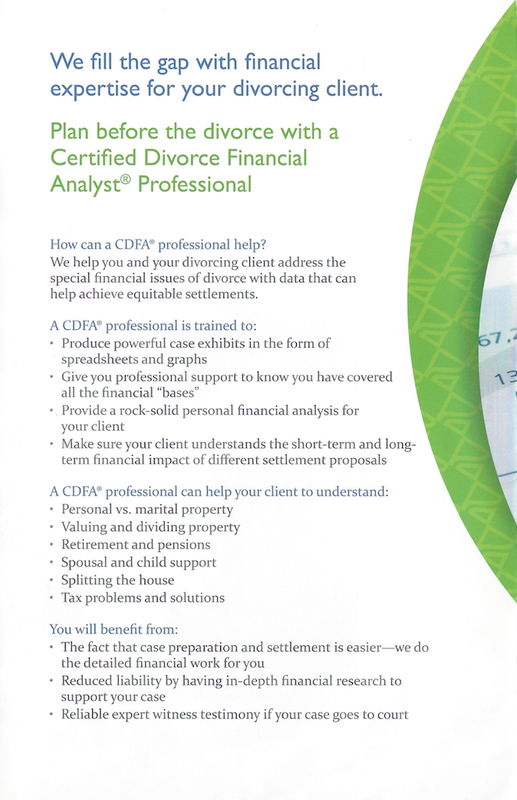 Would it help you to have a qualified and professional Certified Divorce Financial Analyst (CDFA) on your team? 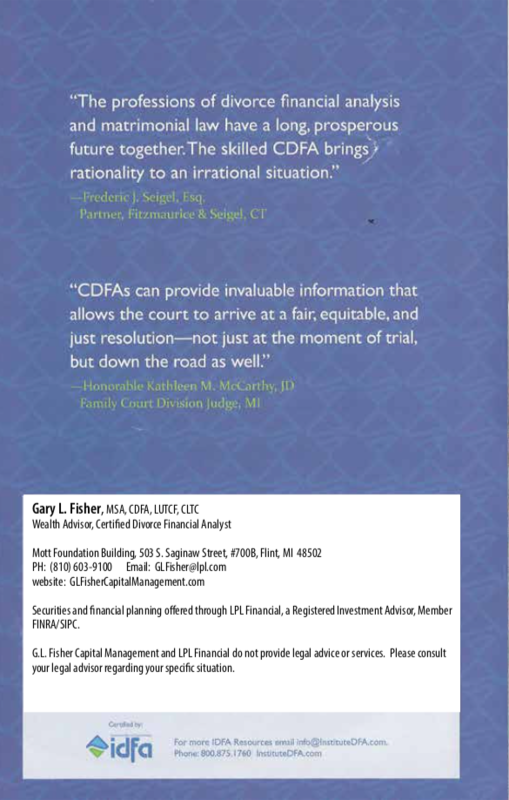 Gary L. Fisher, MSA, CDFA, LUTCF, CLTC, is a CDFA and his role is to to assist you and your client in understanding how the decisions they make today may potentially impact their financial future, both now, and in the long haul. Compiling an asset inventory that also takes tax ramifications into consideration. 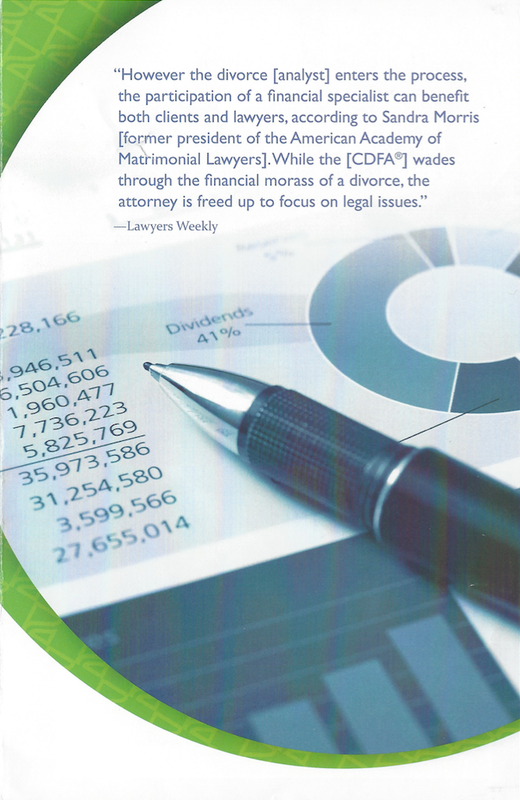 Creating the critical post-divorce budget and spending plan. Reviewing the judgement of divorce relative to potential errors and tax issues, as well as Qualified Domestic Relations Order (QDRO), and account transfer language. Providing another set of eyes to assist in evaluating pension and retirement plans. Helping to determine if the client can afford the marital home, and if not, what he or she can afford. Helping to recognize the tax consequences of different settlement proposals. Collecting financial and expense data. Helping clients identify their future financial goals. Coaching the client and setting retirement objectives. Assistance in determining how much risk they are willing to take with their investments. Supporting the client in identifying what kind of lifestyle they want. In his 25 years in the financial planning arena, Gary has advised thousands of people, many of them through very challenging situations. Particularly during divorce mediations, when it may be very difficult to properly educate a couple on the financial complexities of their settlements, the assistance he can provide to both attorneys and their clients may be invaluable. Gary L. Fisher is not an attorney and does not provide legal advice. All information he provides is financial in nature and should not be construed or relied upon as legal or tax advice. Individuals seeking legal or tax advice should solicit the counsel of competent legal or tax professionals knowledgeable about the divorce laws in their own geographical areas. 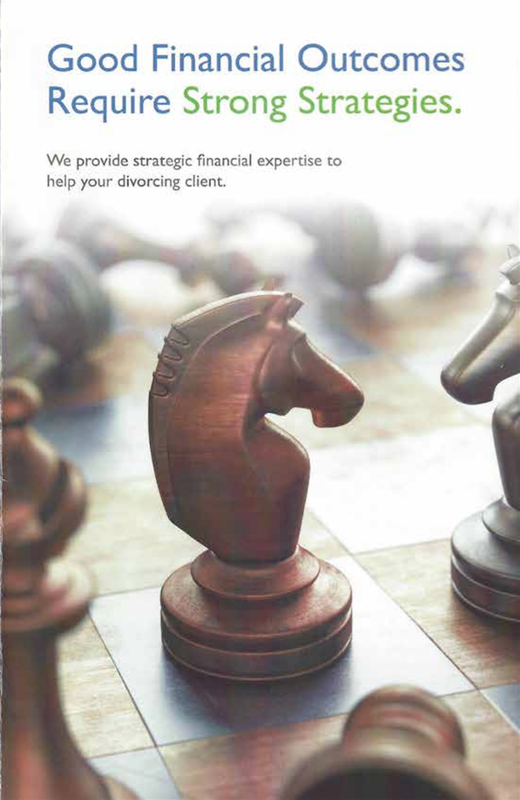 Divorce financial planning is a fee-only process that does not involve investment advice, or securities and insurance transactions.